Winter time has arrived which means shorter days of daylight. For most of us runner it means that you have to run in the dark. In Northern New Jersey where I do most of my runs, I do not have any shoulders on the road, no street lights and a lot of "crazy" drivers. My experience is that most of the drivers don't really respect you as a runner, to busy paying attention to their cell phone texting/talking or Seniors who are to old to drive their Cadillac's . This apply to any running on the roads, not just in the dark. So when I run in the dark, I try to make myself as visible as possible. Of course the rule number 1 is to run on the right side of the road, facing the traffic, again this apply to any running on roads. You wanna see the traffic and get an understanding if they actually see you and respect you. Numerous time I have been forced to take a dive in the ditch because of reasons mentioned above. So when I get out for my night runs I wanna try to make myself as visible as possible. 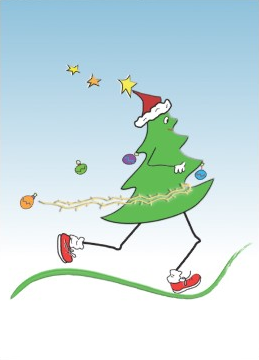 If I look like a Christmas tree in the end, fine, as long as it does not interfere with my running. From top I wear a headlamp, I add a red light in the back. I have had great success with my Princeton Tec Fuel, perfect amount of light and its lightweight. In the back I have a small signal light from Petzl. Upper body: Most jackets have some kind of reflective & illumination features but as my main "source" of reflective & illumination, I wear a Amphipod Xinglet Reflective Wear. This "vest" gives you lot of freedom and does not interfere with your running. 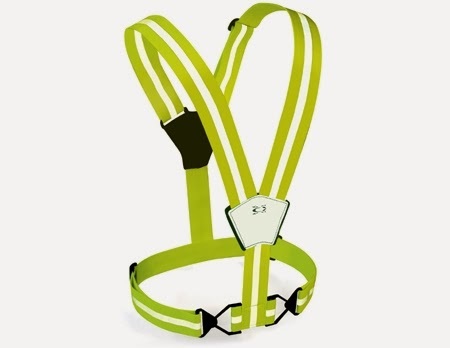 This "vest" also provides 360 degree reflectivity. Legs and arms: Again most of today's tights and jackets comes with some sort of reflective illumination feature. For the legs and arms I add reflective bands from Nathan, they are easy to put on and stays in place while you are running. Adding this to the parts that moves more gives you extra visibility and drivers will see you faster. We have been using shoes from Skechers and the Nite Owl series. The Nite Owl series is GoRun2 ( review here) and GoRun Ride2 (review here) with added photoluminescent technology. We have now tested the shoes for several of runs and walks ( with our dog Tess) and I have to say this technology really works. After only a few hours "charging" the shoes they glow for your entire run or walk. An the glow is sharp! Downside can be if you forget to put the shoes out before your run, it wont work. The shoes need light and to be charged to "lid" up. I have my shoes out 24/7 so its not an issue for me, but if you keep your Nite Owls in the closet, you need to remember to get them out a few hours before your run. I never rely on one source of reflective & illumination gear. The Nite owls or any other products in this blog should not be your single source of light, reflection or illumination. Use them together in order to stay safe on the roads. There are many other ways you can make yourself visible on your run, these are just the equipment I use at the moment. You can find lights and leds for every single piece of your body if you wish. Find the way that works for your running, your gear and environment. As mentioned before I get a little bit paranoid when running in the dark and I wanna make sure the drivers sees me ahead of time. I might look like a Christmas tree when I'm running at night, but that is OK as long as it keeps me safe! The drivers over here equally ignorant of runners as well irrespective of whether it's day or night. What makes it worse is having too much illumination when running alone in the dark here tends to make you the attention of muggers too!